Ready for Sales CRM or Marketing Automation? Technology solutions tend to exaggerate things. If you have a good process, implementing a technology solution will improve it. If you have a bad process, likewise that effect will be magnified. In the course of helping our clients with selecting and implementing sales and marketing automation solutions, our initial discovery talks often lead us to jointly conclude that it’s not yet time, and we instead agree to implement a readiness plan. Over time, our project load has become about evenly split between readiness projects and implementation projects. By first assessing readiness, we tend to find you’ll make better decisions and enjoy improved outcomes. Are basic processes currently in place? If yes, are the processes working? Do we have the resources to close any process “gaps”? If the answer to any of these is no, then you may be a candidate for a readiness project. You certainly wouldn’t want to automate a bad process, and automation is definitely not a cure for a “vacuum” – a lack of process. Above all, don’t buy from anyone who tries to convince you that you’ll figure out the process once you’ve implemented their marketing automation solution. We have seen that course of action result in disenchantment, poor outcomes and underused, expensive tooling. The moral: Implement when ready – not before. 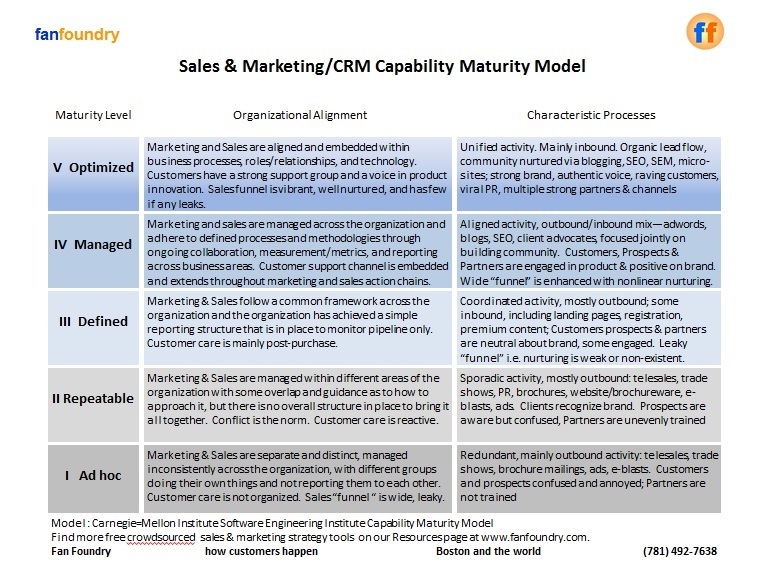 Here are just 2 tools we use to help assess readiness: a Sales & Marketing CRM Maturity Scale, and a “3C” (Content, Conversation, Conversion) process flow map. Click the on-screen images to enlarge, download etc. Here we have adapted Carnegie Mellon University‘s venerable Capability Maturity Model for Software Engineering organizations, modifying it to suit Sales and Marketing organizations. Most raters gravitate toward the middle of a range – in this case, “Level III – Defined”. Upshot: most organizations readily admit there is room for improvement. Download your free copy of this 1-page guide at our Resources page. Enjoy! How should we be involved? Do our processes and our content create a strong CTA (Call to Action) that engages and satisfies strong prospects so they will return, value our resources and assess the fit for our solutions? Do we elicit and gather data of a sufficient depth and breadth to help us fulfill visitor expectations, fulfill their needs, and inform our strategy? Help yourself to these tools, and let us know if you find them useful or need advice. You can either “Leave a Reply” below, or ask privately using the “Got a question” button, or take the quick Readiness Quiz. This entry was posted on Wednesday, March 30th, 2011 at 9:20 AM and is filed under 10 Most Popular Posts, inbound marketing, lead generation, marketing automation etc., web analytics. You can follow any responses to this entry through the RSS 2.0 feed. You can leave a response, or trackback from your own site.